In meeting Kellie I was also able to get to know a great young Canadian artist that lost his life to suicide while battling his bi-polar disorder. Leslie Harvey’s attention to the smallest of details came out in every piece of his art. Not just that the finished dimensions were small but that they were painted with a single hair brush is what struck me the most… perhaps somewhat because my youngest son has always drawn the smallest of characters with the sharpest of pencils. 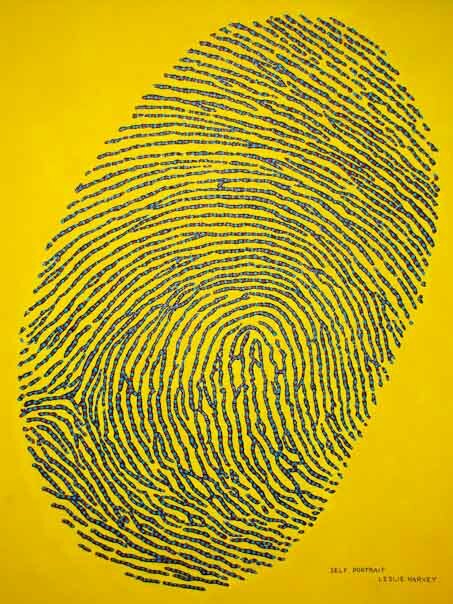 In contrast though was his “self portrait”, a painting of his finger print enlarged to about 12″ x 18″ in meticulous detail, again painted with a single hair brush. Kellie showed me this painting after we talked about the size of foot prints that we leave behind. 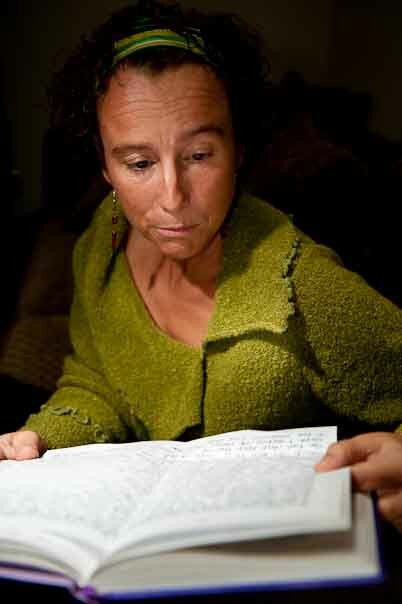 Leslie loved to write and often to Kellie and their two daughters. I photographed Kellie as she read his words. Words written in letters that were full of love and life when his mental health issues separated him from those that he loved most. I arrived in the morning after the girls were at school and when Kellie mentioned that they were sad that they weren’t going to be able to meet me I agreed to return after 3:30. After school we sat at the dining room table enjoying the homemade treats that were made for my visit and sharing a conversation that was made comfortable knowing that I too had lost my father to suicide. This comfort reminded me of the importance of presenting images in the Collateral Damage project of how we are moving forward after such a difficult and complicated loss to suicide. There was a comforting sense of unity in our mutual loss of our fathers to suicide. The comfort comes from understanding and truly seeing that we are not alone as sometimes the overwhelming social stigma will have us believe. Dialogue really does change everything. Thank you for sharing our story. You have had a profound effect on all of us.